Four days away from Mila going back to school and myself “officially” going back to work, I’m slowly getting back into the swing of things. I have started a few comprehensive articles on our recent kitchen, bathroom & bedrooms renovations in our home in France (see #bodieandfourenovations on my Instagram) but none of them are finished. 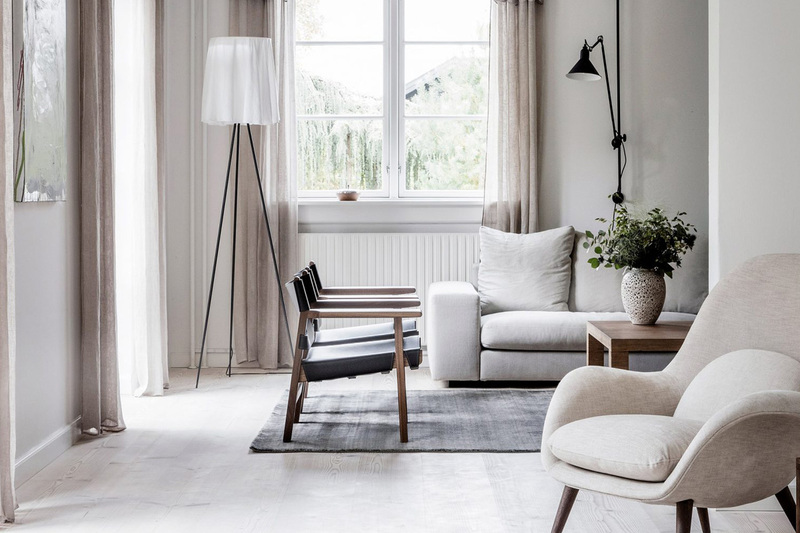 So today I’m showing you the home of Kaja Møller, head of Danish furniture brand Fredericia, decorated with Scandi-inspired neutral tones – a look that at the best of times I find soothing and at its worst, a bit too classical. How about you!? What’s your take on neutral tones!? Kaja Møller, who lives there with her husband and two children, designed the interior herself and creating a succession of rooms in neutral tones, drawing inspiration from French and Italian interior design. In the dining area, the walls are painted in a light shade of grey which contrasts nicely with the black timber ceiling beams and the steel cabinet. I wish we could see more of this steel cabinet as it looks like an interesting feature (check out the Kitchens section here). The Spine wood base stool is available from here in the UK. MADE has also a great selection of high bar stools (click HERE) like these Syrus bar stools with brass legs, this Kendall stool in black and these Edelweiss barstools which I considered ordering while doing our kitchen renovation but in the end, we didn’t do a breakfast bar. The chairs around the dining tables are the stackable Trinidad chairs, available in Ocean here. Large pale tiles increase the sense of space in the kitchen/dining area and provides a great flooring canvas to enhance the black furniture. In the bedroom, textures is added through soft furnishing…a sheepskin casually left on the Stingray rocking chair, a quilted duvet cover on the bed and a rug. The lounge is by far, my favourite room and the one that seems to come together and have a bit of life in it. The Rosy Angelis floor lamp (in the left corner) designed by Philippe Starck, was inspired by the unique way in which a tablecloth drapes over a surface and seems to master over the room while the inviting Swoon armchair (in the foreground) seems to be the perfect place to read a good book. If you love neutral tones, I invite you to check this beautiful apartment in Sweden decorated with white & plywood (really brilliant combo!!) or this Scandinavian home in the countryside which was a major inspiration for our guest bedroom. That dining table chairs are very nice in different style and metal.